Thanks to Pampers for sponsoring our Easy Ups Party and helping us celebrate Manny's next big milestone! My son is a big boy now. He see his older brothers in the bathroom, and he asked to use the potty, too. As a mom to 6, this is great news; we'll finally see the end of diapers soon! In the meantime, however, I have to remember to keep my expectations realistic; it can take months to bring a little guy from his first time using a potty to doing everything on his own and having clean, dry, underwear each day and night. One of the ways we've helped kids throughout the years is with an easy-to-use and fun product like Pampers Easy Ups! 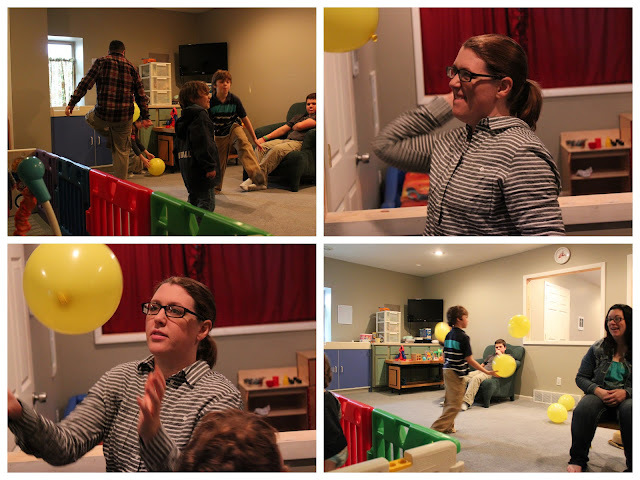 We recently had a fun party to celebrate this new season in life and help other parents and caregivers with their potty training challenges. 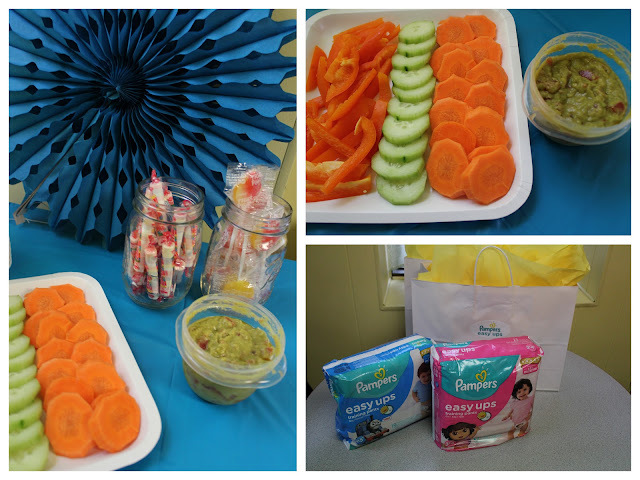 We invited daycare providers and parents to enjoy snacks and chat about how Easy Ups can make the transition stress free for kids and their caregivers. The goody bags were fun to put together, and included potty training charts, helpful tips, coupon savings, and -- of course -- several sizes of Pampers Easy Ups for Girls and Boys. We had everyone attend the event. Including siblings! While we provided some light reading for the little ones, the grownups discussed tips for keeping the end goal of dry pants in mind. Manny really got into the spirit of the party and played really well with the toys and yellow balloons that we had floating around. He was pretty comfy in his Easy Ups! I have to admit that the grown-ups had a good time, too! So, what did we learn with our time together, as parents, caregivers, and lovers of making life less stressful? 1. Pampers Easy Ups can help fill in the gaps when kids are kids. Since no one is perfect, having Easy Ups on hand to prevent leaks for times when little ones have accidents is a must. We like them on car trips, overnights, and when we are out and about and can't deal with soggy outfits. Everyone makes mistakes! They also work for kids of all ages and sizes; Easy Ups come in sizes 2T/3T through 4T/5T! 2. Kids can feel empowered when they know that there's wiggle room. Celebrate their victories and let them know that they are a big kid just for trying. Give them credit for sitting on the potty, even if nothing happens. 3. Easy Ups work great any time of day. There's no need to switch gears (or products) for night-time vs. daytime protection. 4. Characters do make it fun. My 2-year-old loves the Thomas the Train on his Easy Ups and often points to them and smiles when we change them! The step-in design helps him to feel big, even though they can come off like a diaper, when needed. Graphics fade when wet to help little ones learn and for me to know that they need a changing -- without me having to invade their personal space. Our Easy Ups party was a success, just like all those parents and caregivers who encourage their little ones to grow a bit every day. I feel so blessed to live in a time when innovative products help me be the best parent I can be! Visit Pampers for even more fun ways to encourage independence. Or you can see them on Facebook and Twitter!